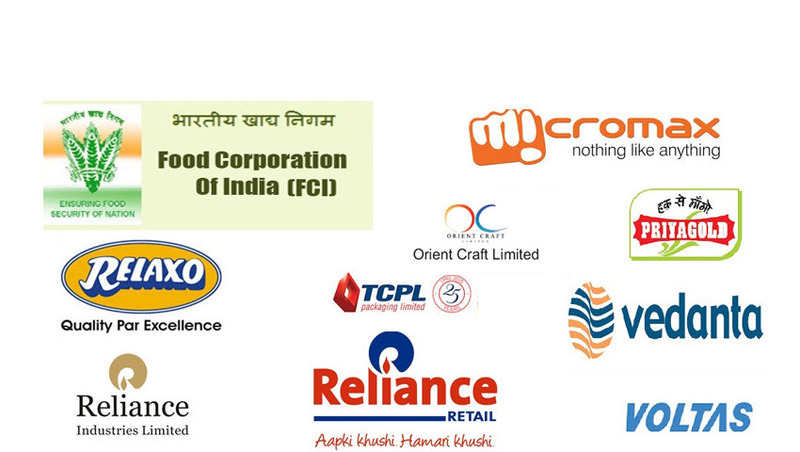 We are a leading Manufacturers & Exporters of Chain Conveyors such as Wire Mesh Chain Conveyor, Drag Chain Conveyor, Slat Conveyor, Free Flow Chain Conveyor and Multichain Conveyor. We have over 30 years of experience in design & manufacturing customized chain conveyor systems for various applicaitons. Our ISO 9001:2008 systems certified workshop is fully equiped with fabrication equipments and is located in Noida (Delhi NCR). Our Drag Chain Conveyor (Scrapper/ Redler Chain) are well suited for economical conveying of bulk materials - coal, sludge, biomass, clinker etc. Useful in conveying a wide variety of bulk materials. Can be used to convey loads over horizontal & inclined distances or horizontal curves. Can be used in totally enclosed, dust & contamination free handling systems. Suitable for heavy load applications. Flexibility of having any number of loading/unloading points along the conveying path. 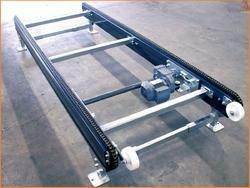 Mounting: Can be used as in-floor mounting or on-floor mounted conveyors. Chains: Wide variety of chains with different breaking strengths & properties available to suit every application. Our Free Flow Chain Conveyors are excellent solutions for low pressure accumulation conveying for assembly/online testing/packing lines. 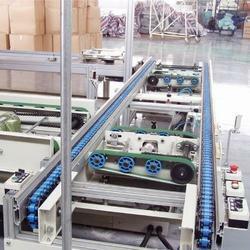 These conveyors find wide use with Electronics Contract Manufacturing & Electronics Manufacturing Service providers. Modular Construction - Use flexible light weight modular designs - for flexibility in changing configurations/conveying paths. Live pallets - Electric power supply to moving pallets enable component testing while moving. Pallet Return - Available with integrated systems for transfer and return of empty pallets. Structure: Available in MS/SS & extruded aluminum sections. Accessories: Side working tables, Lighting arrangements, display boards, tool holders. Our Wire Mesh Belt Conveyors are well suited to impact loading and find use in drying operations, painting, wet or oily applications and extreme temperature applications. Useful in moving a wide variety of heavy loads. Can be used to convey loads over horizontal & inclined distances or horizontal curves. Excellent resistance to impact loading. Can be used in totally enclosed, dust & contamination free handling systems such as heating chambers & chemical treatment. Highly suitable for conveying greasy/hot/chemical/food products. Resistance to low/high temperatures, chemical corrosion, abrasion & impact. Easy flow of air/water/steam or any other fluid. For conveying heavy, medium & light weight products of same/different sizes, especially in ovens,impact loading, chemical & heat treatment processes. Structure: Available in MS/SS options to suit different applications. 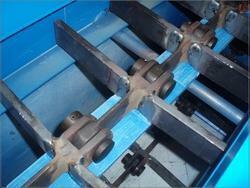 We manufacture customized scraper conveyors as per the requirement for the application. These conveyors provide efficient solutions for conveying of bulk materials in completely enclosed manner. The materials and wear liners of the conveyor are customized as per the abrasiveness of the materials and their temperature. A wide variety of chains are used depending on the pulling load on the chain depending on the conveying capacity & conveyor length. 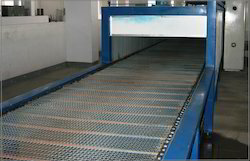 We design and manufacture superior quality Cooling Conveyors having wire mesh chains. These are widely used to convey heavy to medium loading. Hence, these products are extensively used in various drying operations, painting, wet or oily applications and extreme temperature applications. 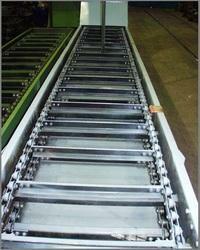 Our conveyors are known for their durability and reliability. For conveying heavy, medium & light weight products of same/different sizes, especially in ovens, impact loading, chemical & heat treatment processes. Our Chain Conveyors use double or multiple chain strands driven by sprockets and are suitable for conveying heavy loads. Useful in moving a wide variety of heavy products, especially pallets, skids, drums & similar large sized objects. Wide application in heavy manufacturing lines. Suitable for heavy load applications - assemblies & components. Versatile conveyors which can be used in washing, loading, assembly, heating processes, and even chemical treatment. For conveying heavy & medium weight products for wide range of manufacturing processes. Load: Available in skid handling, pallet handling or component handling configurations.